Then pass on the book, receive another in its place, and repeat. 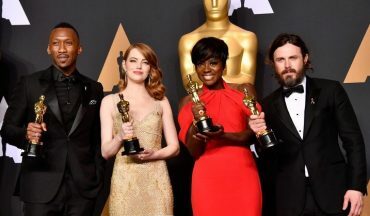 It’s been such an interesting project to be part of. I’ve found it stimulating, challenging and times incredibly frustrating. But what I’ve most enjoyed it that it’s pushed me out of my comfort zone and forced me to create pieces of work on subjects that I wouldn’t have considered. It’s also been interesting seeing everyone else’s interpretation of your theme in their own stitching style. The most recent book I received was on the theme of 17th Century poetry, with one poem in particular at its core. This poem was ‘In prayse of the needle by John Taylor, written in 1631. So long at least, the needles’ use shall last. The text mentions various fibres types such as flax (linen), wool, and silk so plenty of ideas there for base fabrics. After my usual deliberation, I decided I would recreate ‘17th century poetry’ as if the piece was a rare and delicate artefact from a museum. 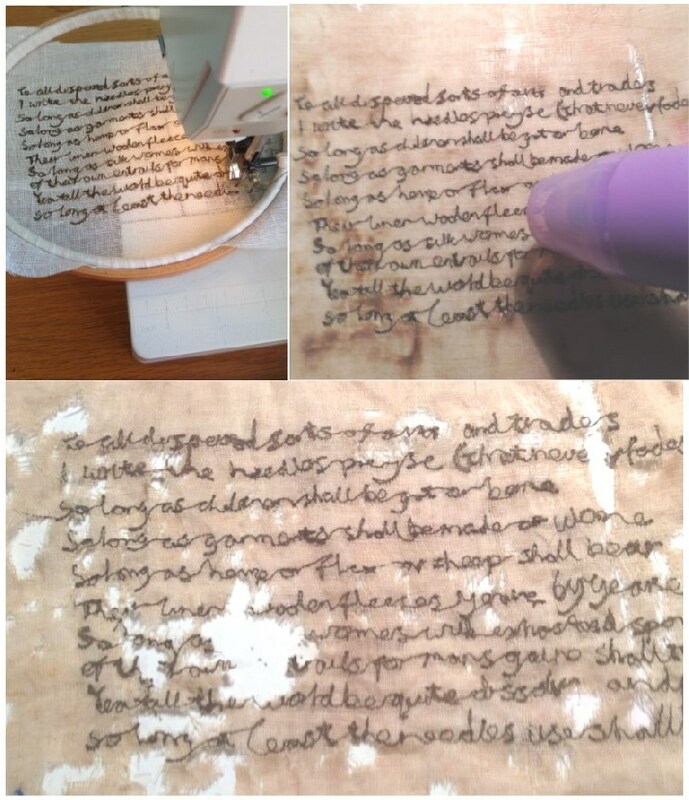 My idea was therefore to stitch the poem onto vanishing muslin. This fabric looks like normal muslin, except it turns brown and crumbly when heated with a hot iron or heat tool. So here’s a little tutorial on how I accomplished the desired look. Firstly I wrote the poem in pencil on the vanishing muslin. Then I choose a mid-brown matt thread and used free-motion embroidery to stitch the words. No cheating – I didn’t use any automatic stitch programs! It had to have the natural unevenness of handwriting.I used a hot iron over the piece but it didn’t give me the effect I wanted. 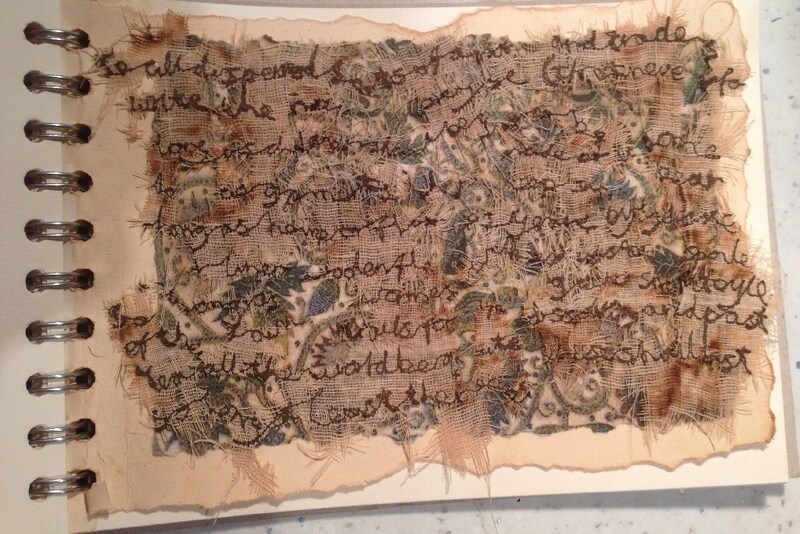 I was trying to recreate a 400 year-old piece of textile after all. So the next step was the heat gun! This was much faster and distressed the muslin to the degree I needed. I also cut away quite a bit of the stitching. I was aiming for a crumbling relic, after all so no point being precious about it. I sourced a print of Elizabethan embroidered fabric to act as a backing for the stitching, so I needed to see the ‘fabric’ through the holes in the stitching. I stained the print in tea to age it. Travelling books – In prayse of the needle. The Embroiderer’s Guild is a international organisation founded in 1906 to preserve needlework skills. Since then, we’ve moved on and it now offers regular meeting and workshop opportunities for those who enjoy needlework and textiles of all sorts. 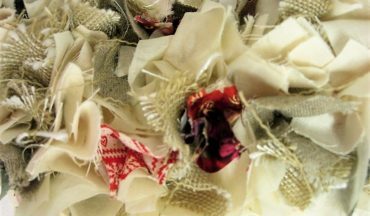 The Guild welcomes everyone with an interest in any area of embroidery and we are proud to be recognised as a voice for raising the profile of textile and stitched art. You don’t need to be a professional embroiderer, or work in textiles in any way. Nor is there any test or quality standard to pass before you can join. It’s just a lovely way to meet with like-minded people. We have regular meetings, events, workshops and stitching sessions. 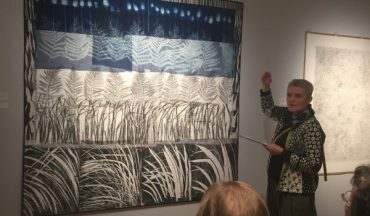 This year we’ve worked with students at Edinburgh College of Art to create digitally-printed fabric using the archive from the Needlework Development scheme. Some members are also currently involved in a project to stitch a painting in the National Gallery of Scotland, and can be found there most Wednesdays, stitching away and chatting to visitors and encouraging them to add a stitch or two. 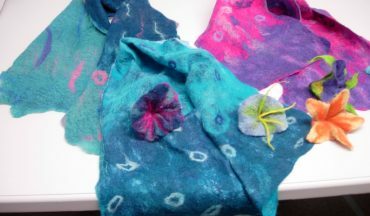 To learn some textiles arts skills, have a browse at my range of Creative Workshops.